» Why Are Big Billboard Companies Fighting Change in California Law To Penalize Sign Scofflaws? 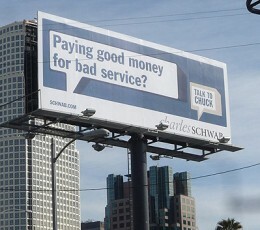 Why Are Big Billboard Companies Fighting Change in California Law To Penalize Sign Scofflaws? You might think that Clear Channel, the world’s biggest billboard owner and a company that promotes itself as a responsible member of the communities it operates in, would not oppose a bill currently pending before the California State Senate that would levy fines and require disgorgement of revenue from companies that illegally erect or modify their billboards and other outdoor advertising signs. However, you would be wrong. Clear Channel, along with other billboard companies like CBS Outdoor, are vigorously lobbying against SB1470, a bill by San Francisco Sen. Mark Leno that would remove a loophole in state law allowing a company cited for illegally erecting or modifying a billboard to bring that billboard into compliance without suffering any penalty. In other words, Clear Channel, CBS, or some other billboard company can erect or illegally alter a billboard, and the worst that can happen if they are caught is to be forced to bring the sign into compliance with existing laws. Instead of being required to remove the sign and pay significant penalties, the company would keep all the revenue collected while the sign operated illegally. To read more details about the bill, and to send a letter to your state senator supporting SB1470 if you’re a California resident, click here.